How to Die in Three Easy Steps. I can't say I was ever a huge Warren Zevon fan. I'm mean, sure, I dug his hit song "Werewolves of London" as much as the next lycanophile, but it was never enough to make me go out and buy the CD. (1978's "Excitable Boy" for those of you keeping track.) When I'd come across Zevon's albums in the $3.99 bin of the local record store I was never inspired to part with my hard earned dollars. For that matter, I've just never found much appeal in the whole of the "70's singer/songwriter" acts. I primarily think of Jackson Brown as the guy who beat up Daryl Hannah. Bruce Springsteen didn't show up on my radar until the eighties. And Warren Zevon was just a guy emitting sarcastic howls over a bluesy chord progression. Still, when I recently caught wind of the fact that Mr. Zevon had terminal lung cancer my curiosity perked up. You can't help but take a morbid interest in the final decline of a rock and roll star. It helps ease the raging jealousy fueled by the realization that their life was exactly 1,098 times more exciting than yours will ever be. How did I come about the news of Zevon's condition? In the most gentle way possible - by reading a USATODAY article on the subject while eating an "All American Slam" at Denny's. It was a standard journalistic send off - a summation of Zevon's musical contributions and personal tribulations peppered with several witty quotes of a lyricist known for his blunt tongue. The following stood out. And that's when I realized: here's someone who gets it. "Gets what?" you ask. "Are you saying that Warren Zevon gets that we all have a limited time in this mortal plane before hurtling into a murky black void that swallows our souls for all eternity?" *Unfortunately, Boeken died of cancer before I had a chance to kill him. Three things that Richard Boeken certainly never deserved. And three things that Warren Zevon, when the times comes, will have. Because a lot of how you die depends on how you lived. As for me, I think I'm going to pick up a copy of "Werewolves of London." But I better do it soon, because once Warren dies, I won't be able to find it in the $3.99 bin. 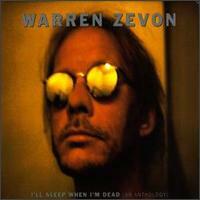 You might also enjoy: Interesting Motherfuckers: Warren Zevon.